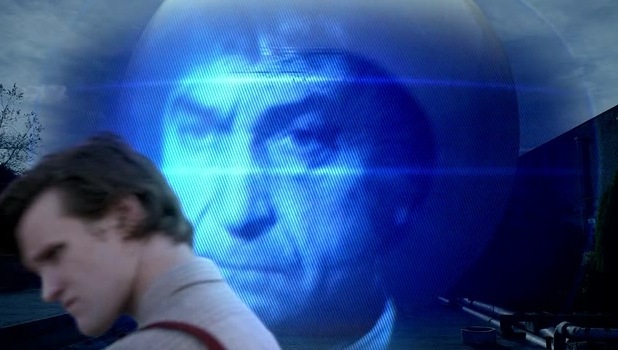 Back in January, I wrote about The Doctor’s swan song. Now, three months later, he’s back again, but in a different form. This time, Matt Smith takes over the titular role in the longest running science fiction series. The Doctor, as we all know, is a time traveler, who once ran from his own people, and found refuge with his granddaughter on Earth. Unfortunately her nosy teachers sent them fleeing again, and since that fateful day in 1963, the Doctor has been on the run. Though his companions have come and gone1, and through a process known as Regeneration, the Doctor’s changed his appearance and personality, he’s still the same 900 year old Time Lord from the planet Gallifrey. With the change in Doctors, the series also sees a change in production staff. Most notable is Steven Moffat taking over the helm of the show. Many people remember Moffat from his BBC2 sitcom Coupling. With his arrival into the Doctor Who-niverse, the audience sees a definite change in tone. The premiere leads me to believe that the show will be much darker, while still keeping much of the fun that made Doctor Who such a great series to begin with. To begin with, this episode is very much a genesis story. We have a new Doctor, and he’s unsure of who he is, and what he is. 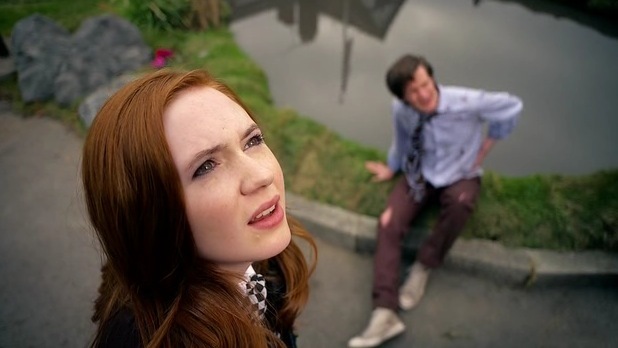 As usual there are some comedic moments as the Doctor gets used to himself, but the Doctor immediately starts to form a bond with a young Amelia Pond. After crashing in the Scottish orphan’s garden, the Doctor discovers a crack in time a space is found in the girl’s bedroom2 He repairs it, and then hears the TARDIS’ Cloister Bell, he runs off and promises to return in five minutes. Well, he returns twelve years later. Twelve years later, Amy’s a stripper, who’s been waiting for her Doctor to return. Okay, I know you’re going to say that she’s a “kiss-a-gram,” but the subtext between Pond and the Doctor when he questions what a kiss-a-gram is makes it plain as day that she’s a stripper, but you can’t say that on a family show. Moffat once said of Amy Pond, “A generation of little girls will want to be her. And a generation of little boys will want them to be her too.” The young woman is beautiful, smart, tough and funny, all aspects of companions during Russell T. Davies run, but for once all in one character ((Rose, was not smart, or tough, or funny, or even really beautiful, but still a good companion. Martha wasn’t tough, she was a pushover, and she wasn’t very funny either. Donna was tough and funny, but not so much beautiful or smart.)). Eccleston began his tenure as the Doctor with the statement, “I’m the Doctor, run for your life” as he warned Rose of the danger that was chasing them. This Doctor begins his tenure on the offensive. The danger is a background in this story. The true plotline comes from the Doctor’s strange ability to enchant anyone he comes in contact with. When it comes to a small child, he not only enchants, but creates an obsession. Who wouldn’t be thrilled to run away with a kookie time traveler in a magic blue box? 8 year old Pond is the perfect dreamer to want those travels. She’s an orphan, living in her aunt’s house, uncomfortable in England3 afraid of the house’s horrors. While this might be why a small town would most know Amy Pond, it seems that the entire town knows her for her obsession with the Doctor, her imaginary friend she’s been waiting twelve years for. This seems to be what I think is most intriguing about Pond. She’s the child we all were/are. She’s looking at the Doctor through the eyes of a child, full of wonder and with a great desire to run off with him4. She is the embodiment of the eight year olds who are hiding behind their sofas every Saturday night. One thing Moffat seemed best able to do better than any other writer during the Davies-days was to tell of the Doctor’s non-linear life. Yes, the Doctor travels through time and space, but rarely do his stories or his life deviate from a normal path of point a to b to c. Moffat did this with “The Girl in the Fireplace,” “Blink” and “Silence in the Library”/”Forest of the Dead.” In “The Girl in the Fireplace,” the Doctor is running around between the 51st century and 18th century France. Sure, the Doctor is narratively traveling in a singular line, but Madame de Pompadour is traveling the slow path, while the Doctor travels the fast path. She’s living her life in France, while the Doctor is randomly popping in at points in her life, with only hours between. Finally in “Silence in the Library”/”Forest of the Dead,” the Doctor meets River Song, a woman who knows him, intimately. How’s this possible? Well, he’s a time traveler. That’s kinda what happens when you meet a time traveler. Just look at Guinan and Picard. According to Picard, they met some time when he was in command aboard the Stargazer.6 Picard met her and they fast became friends. If you asked Guinan, she would tell you that the first time they met was in 19th century Earth, where she was just hanging, and Picard was looking for a beheaded Data. 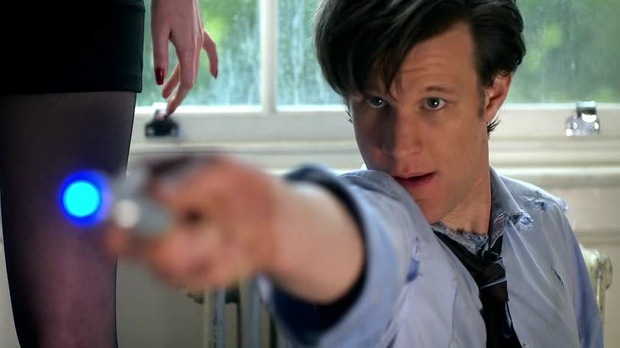 So Song met el Doctor at some point, we can presume in Matt Smith form, but the Doctor first met her in the Library. So yeah, Moffat writes good Doctor Who. I think this’ll be fun.